"Happiness that contributes to individual, community or global well-being and does not exploit other people, the environment, or future generations." Sustainable happiness is about well-being for all, sustainably. This offers a fresh approach to happiness that invites reflection on sustainability issues coupled with opportunities to enhance our quality of life and contribute to individual, community, and global well-being. 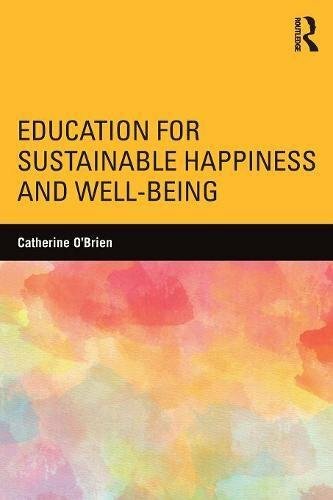 Dr. Catherine O’Brien applied her expertise in sustainability education to create the concept of sustainable happiness in order explore opportunities for people and ecosystems to flourish. Sustainable happiness has been incorporated into post-secondary courses at Cape Breton University and a sustainable happiness certificate offered at Dawson College in Montreal. The online course in sustainable happiness is available for the general public. Dr. O’Brien’s work has been recognized internationally and in 2012 she was an invited participant at the UN High Level Meeting on Happiness and Wellbeing. She is the author of Education for Sustainable Happiness and Well-being.